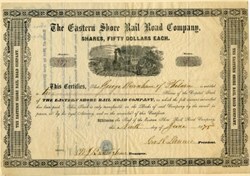 Beautiful RARE uncancelled stock certificate from the Eastern Shore Rail Road Company issued in 1875. This historic document has an ornate border around it with a vignette of an open cab train passing miners. This item has the signatures of the Company's President, George R. Dennis and Treasurer, W.J. Brettingham. The Eastern Shore Railroad Company was organized to construct a line from Delmar southwest to Somers Cove, the only deep water port near Tangier Sound. The initial construction from Delmar, Maryland south to Salisbury, Maryland was completed in 1860. Following the Civil War, construction of the line resumed; the first train arrived at the road's southern terminus Sommers Cove, Crisfield on November 4, 1866. The line was 40 miles long. The company's business office was located in Princess Anne, Maryland.